This volume includes the full Health Technology Assessment (HTA) report on effectiveness, appropriateness, safety and costs of homoeopathy in health care. The report was commissioned by the Swiss health authorities to inform decision-making on the further inclusion of homoeopathy in the list of services covered by statutory health insurance. Other studies carried out as part of the Swiss Complementary Medicine Evaluation Programme (PEK) caused a massive stir due to their schematic and exclusively quantitative (negative-)outcomes for homoeopathy. 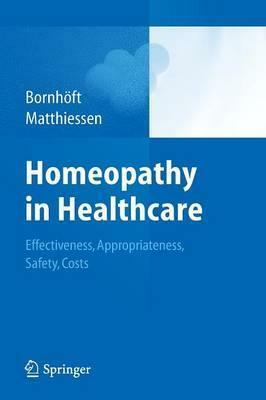 The present report, in contrast, offers a differentiated evaluation of the practice of homoeopathy in health care. It confirms homoeopathy as a valuable addition to the conventional medical landscape - a status it has been holding for a long time in practical health care. Illustrations note 3 Illustrations, color; 6 Illustrations, black and white; 300 p. 9 illus., 3 illus. in color. Background and objectives of the HTA.- Introduction to the specialty of homoeopathy principles and definition.- Homoeopathy: research and research problems.- General problems with clinical trials in research.- HTA homoeopathy - methods and material.- International utilization of complementary medical approaches.- CAM conditions and use in Switzerland.- Overview of systematic reviews on the clinical efficacy of homoeopathy.- Clinical studies on the effectiveness of homoeopathy for the indication URTI/A (Upper respiratory tract infections and Allergic Reactions).- Safety of homoeopathic use.- Cost-effectiveness of homoeopathy.-Full discussion of HTA results.